Detail of a Bergdorf Goodman holiday window, “The Book Club,” November 2016. It has been a whirlwind of a month since I snapped these pictures at Bergdorf Goodman (and saw the gorgeous windows at Tiffany & Co. too), but I still wanted to share them here on the blog. The theme this year was “Destination Extraordinary.” It was really all about the green on the Fifth Avenue side of the store, and now that we know the Pantone Color of the Year for 2017 is Greenery (though I have to say, who died and made them Color Boss? ), I wonder if the BG designers had, ahem, a window into this information. Van Cleef & Arpels, right next door, also had very green windows this year, so maybe they were all in on it. Marc Jacobs Resort dress, Kentshire jewelry. The windows are always very beautiful and these are no exception but I tell you, I really do favor a winter wonderland in holiday windows. These felt very tropical to me, as if I was transported to Florida. 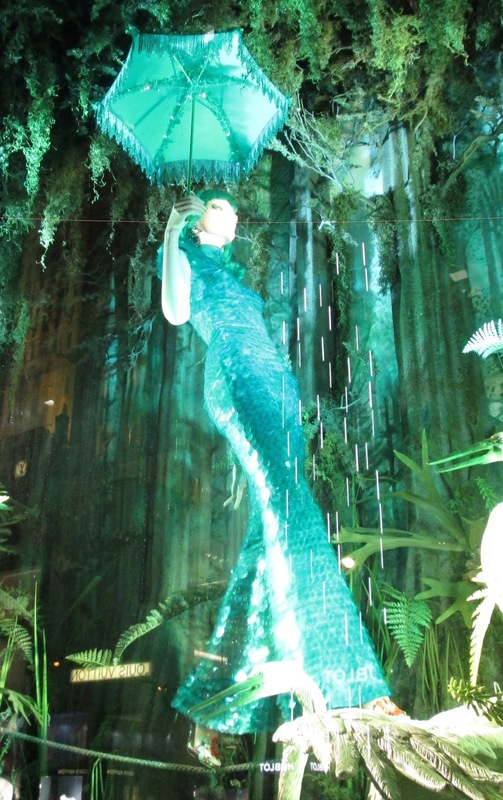 Still, the design, artistry, and craftsmanship is unparalleled, and I feel gratitude every year that the wonderful people at Bergdorf never cease to go for it with the windows. I love them for it. Love this sequined jumpsuit by CD Greene. Even accessories are in on the act. A focus on clutches and shoes and birds! A Gucci dress for Spring 2017. Another great mannequin, wearing Roberto Cavalli Resort, Tom Ford, and Valentino. Dress by Dolce & Gabbana. A window on 58th Street. I always love when the Bergdorf designers do a view-from-above window, like this one on the 58th Street side of the store. A Spring 2017 dress by Delpozo. The window below might actually be my favorite of the year (though “The Book Club,” at the top of the post, is a close second). I can’t say no to horses that can fly and star-spangled shoes! Who can resist winged horses? Elie Saab gown, shoes by Saint Laurent. Let me know if you have a favorite window from the ones shown here, and if you saw them in person tell me what you thought of them! I hope you have a wonderful holiday. Jill, these are beautiful windows but I'm with you--I like a winter wonderland display at this time of year. Having just visited Florida a few days ago, I can attest to the tropical paradise not quite sending 'holiday vibes' my way. It reminded me of our Christmases spent in the P.I. and S.D. Personal preference is cold weather, glowing fireplaces, and hot chocolate...it'll be hot and sticky again before we know it!! As much as I do love these windows - they are a little too tropical and Floridian for me. When I was saw these beautiful windows, I kept hearing the Muppet's song "Its Not Easy Being Green". I am probably just old-fashioned & still love Winter Wonderland, Nutcracker and Victorian themes for Christmas. I like to see snowmen and angels and reindeer! Your posts are so welcome throughout the year and I do love to see the amazing jewels that you share with us. I love seeing these pictures, Jill! 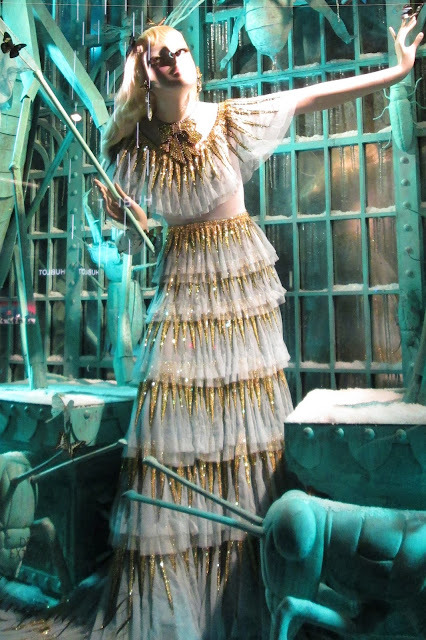 When we used to go out to New York at Christmas, we made it a point to walk the Christmas windows because they are so extraordinary! !